I'd feel sorry to myself if I'm not travelling anywhere during this 3-month-vacation. Fortunately near to the end of it, I got to travel to Redang Island with Chan Wei, Xin Ying and my girlfriend, Joling. We took a night bus from Komtar, Penang and reached Kuala Terengganu in the next morning. While waiting for the boat, we brushed our teeth, Facebooked and ate sushis, prepared by Joling. After boarding the boat, together with a few groups of tourists whom we're not acquainted with, we reached Redang Island in about, hmmm... 5 minutes? When it's driving ashore, I can see that the seawater is truely almost blue-ish clear!! OH MY GOODNESS, I thought I can only see this on TV or magazine, now I'm here!! Although it's not somewhere famous like San Diego, the scenery excited me. Our room was unexpectedly spacious. Breakfast, lunch and dinner are all in buffet style. This is one of the must-visit-places when you travel to Redang - More More Tea Inn, the place where scenes in 《夏日麽麽茶》 were filmed. This was spectacular and it's my first time seeing a full moon with it's reflection on the sea from the horizon. We managed to rent a waterproof camera from the resort, in order to take photos in the sea while snorkeling. Clean water from the mountain? You have to be careful while snorkeling because my leg was cut by the coral rocks for a few times. 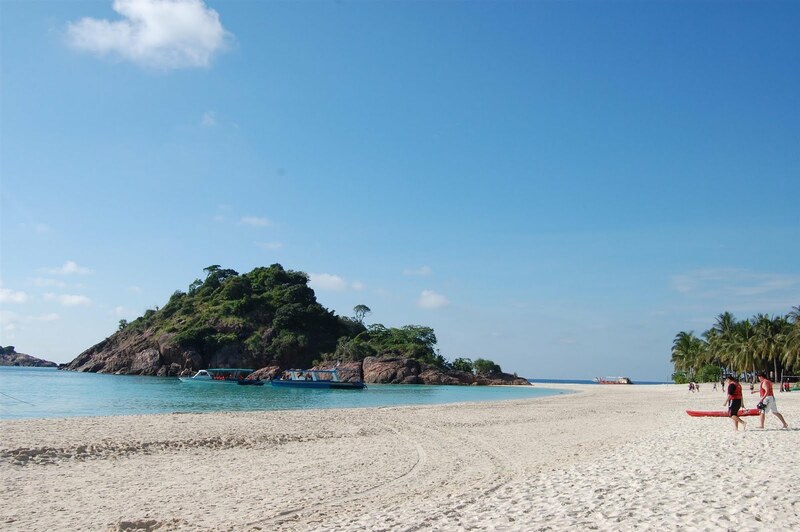 We heard that there's blue sand at the beach in front of Redang Reef Resort. We don't know the correct way to make them appear, but we just dragged the sands with our slippers. And by chance, miraculously we saw some blue glowing spots tiny little which fade off after about a second. Wasn't that amazing? After doing some researches, I found out that those are some kind of microscopic crustaceans called Bioluminescent Ostracods, or just simply Sea Fireflies, and their glows are due to the luminescent chemicals produced. Not many photos to take about, as we're leaving Redang Island. Even if it's so sunny and hot outside, you will spend your time playing and running around beneath the huge sun (ok, maybe just for the purpose of taking pictures). It's a nice holiday for me and each of them as well and our expenditure was RM400 if I'm not mistaken. For more photos, please check out my photo album "Redang Trip" on Facebook.